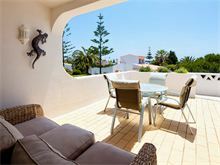 This great value villa is in the heart of Algarve Clube Atlantico, just a short walk from the beautiful Carvalho beach. The interior is traditionally styled with an open plan living/dining area and a covered terrace overlooking the pool and garden. 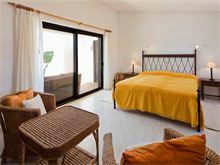 The master bedroom upstairs also features a further terrace with comfortable furniture and takes advantage of the sea views. 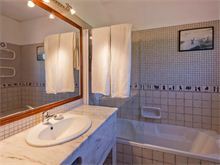 Each bedroom has its own bath or shower room and benefits from air conditioning. Gated drive with parking. Entrance hall. Kitchen with dishwasher and microwave. Open plan living room with dining area and patio doors leading to a covered terrace overlooking the pool and garden, TV and DVD. 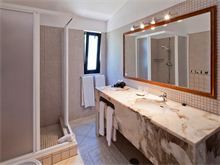 Twin bedroom with bathroom en suite and further twin bedroom with shower room en suite. Upstairs to master double bedroom (twin mattresses on a double base), en suite bathroom and patio doors to covered terrace. Maid service 5 times per week, laundry by arrangement. Air conditioning (bedrooms only) is available at extra cost, if required. Pool heating is charged for locally (metered gas) but should be requested in advance if required. 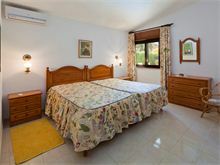 The villa was clean, spacious and very comfortable with a lovely pool and garden area. The balcony in the master bedroom had a great view to the sea and with the sandy beach only 10 minutes walk away the villa was perfectly situated for us. The communal pool at Club Atlantica gave our children a chance to meet other young people and the safe environment meant they had some independence. There were some great local restaurants but mainly we stayed in the villa and had barbecues. The wifi worked very well and kept our teenagers happy. The daily maid service was a fantastic bonus and meant the grown ups weren't cleaning up all the time which was a true holiday. We had a fantastic holiday at the villa and would recommend it. Ideal for a private and relaxing holiday, only a short stroll away from pretty Carvalho beach and a short drive from Carvoeiro town. 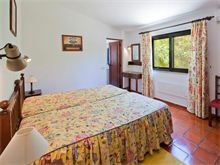 The villa itself was well-equipped and kept spotlessly clean throughout our stay with an immaculately-kept garden to match. The pool was perfect for a cooling swim. 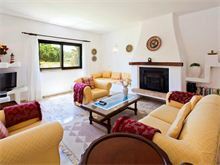 This was a lovely villa, very spacious and comfortable with a beautiful pool and garden. It was in a very quiet location, with an excellent restaurant just round the corner that does takeaways too! The beautiful beach is just a short walk away. We visited in April so paid the extra to have the pool heated. We had a lovely week, despite the mixed weather and the maid was lovely. Villa was excellent for our needs. We didn’t pay for pool heating but may have been a requirement if the weather had not been so good. The villa was perfect for us - me, my husband and our two mums. Plenty of room, beautifully laid out, exceptionally clean. We had everything we needed. The pool was fantastic and very clean - we used it every day. The location was good - very quiet so perfect for us. We used taxis if we wanted to get around in the evening - they were very reliable and good value (cheaper than the shuttle). We used a hire car to explore the region. Overall we had a lovely holiday, thank you Affinity Villas. We had a fantastic family holiday and loved the villa and the beach coves. It was very quiet. 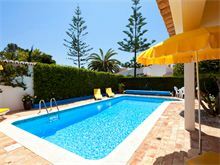 The villa was extremely clean, lovely little garden, fantastic pool, close to beautiful sandy beaches and all amenities (restaurants, supermarkets) - perfect holiday for us and our three kids. 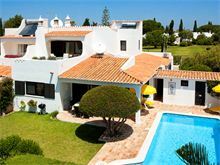 Excellent villa in close proximity to a beautiful beach. Maid service was superb and she was very kind with our three year old son. We had the pool heated which was fantastic for night time dips in the pool. There is a small supermarket within a 15 minute walk. Our son enjoyed the park opposite the villa. Beautiful setting and very quiet. 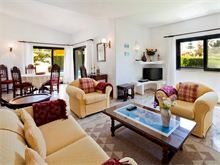 A lovely, comfortable well equipped villa. Lovely location for a family, near the play park, 10 minutes walk to a lovely beach. Everything was very clean and beds comfortable. Would recommend a hire car for accessing restaurants and supermarkets. Comfortable villa with great facilities in a terrific setting, with a super beach and dramatic clifftop walks on the doorstep. 3 or 4 good restaurants and mini-market within easy (15 min) walking distance. Car definitely needed for everything else. 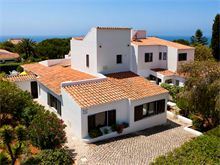 There are better supermarkets a 10 min drive away, and visits to Silves, Faro (especially the walled old town), Lagos and other sights are within easy driving distance. Location is fabulous. Car hire is recommended, however, the bus service is excellent and we will use this next time. Great views from the upstairs terrace. Fourth time with Affinity Villas, looking forward to the fifth. 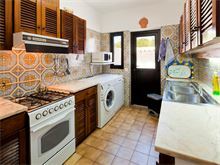 Casa Catarina exceeded our expectations and we cannot wait to return next year!